Monarch buttterfly; photo by Dave Bledsoe on Flickr (noncommercial use permitted with attribution / share alike). Both the caterpillar and adult monarch butterfly are brilliant in color as a warning to predators (the monarch ingests toxins from the milkweed plant which are poisonous). 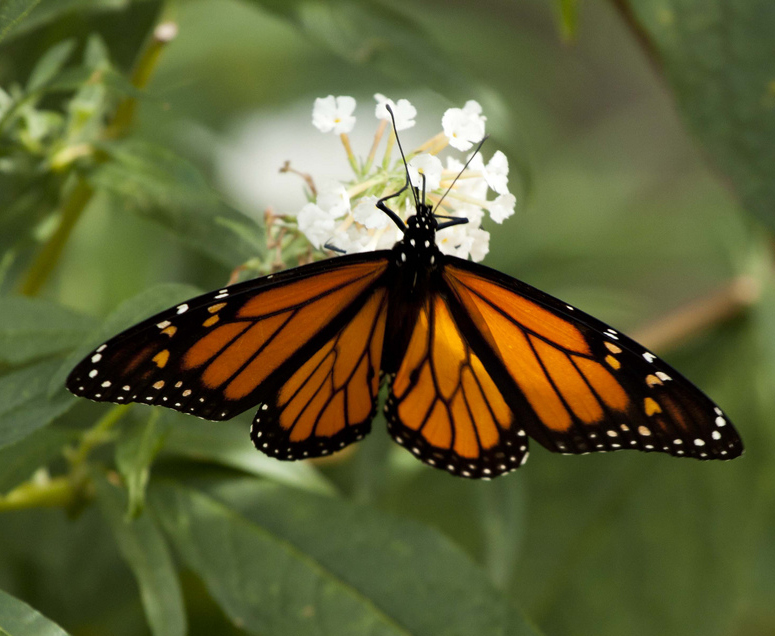 Seen soaring and gliding across the USA during the summer, monarchs make an incredible 2,500-mile migration each year to their nesting grounds in Mexico and southern California. 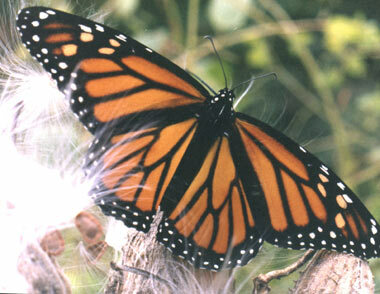 Monarch butterflies are threatened and being considered for protection under The U.S. 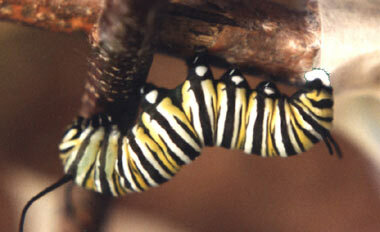 Endangered Species Act (monarch populations have fallen by possibly 90 percent during the last two decades). Female monarch butterfly on milkweed © photographer Lynn M. Rosenblatt, author of "Monarch Magic" (Worthy / Ideals) and "Monarch Buddies, Munch-A-Bunch of Milkweed" (Mindstir Media) Monarch Butterfly USA (all rights reserved; used by permission). Monarch caterpillar © photographer Lynn M. Rosenblatt, author of "Monarch Magic" (Worthy / Ideals) and "Monarch Buddies, Munch-A-Bunch of Milkweed" (Mindstir Media) Monarch Butterfly USA (all rights reserved; used by permission).